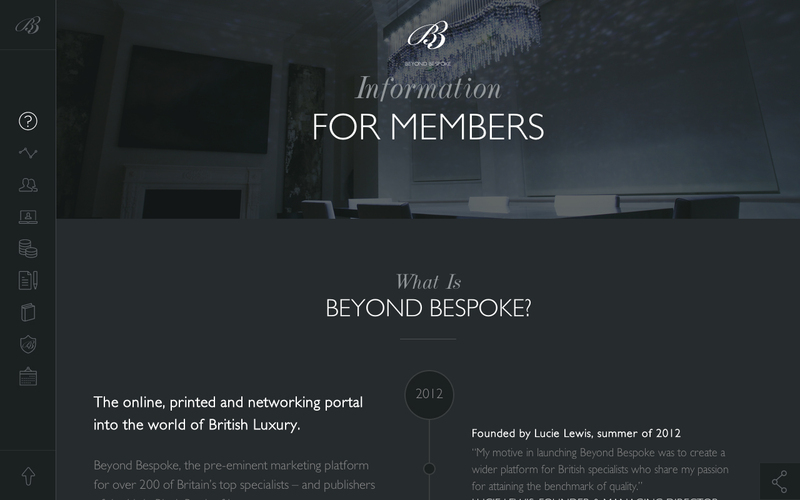 Loads of neat CSS load transitions as you scroll down this WordPress integrated One Pager for luxury members directory, ‘Beyond Bespoke’. The responsive adaption is quite impressive considering the volume of content including several infographics. We were approached by Beyond Bespoke to create an attractive, promotional site to send out to their members, giving them an overview of the business and the key stats and benefits of joining. To achieve this we put together a very sleek, fully responsive one pager that utilises a few neat tricks such as waypoint based animation to create the smooth loading effects, fully css based graphs and charts that are content managed by the Wordpress back end, responsive images served on different device sizes, parallax effects and a whole lot more.